This 1885 appearance was found in a report of the visit by the districts Liberal Parliamentary Candidate. 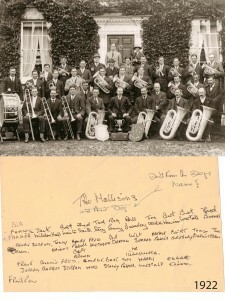 It stated that the Aldbourne band headed a procession out towards Preston to “meet the man”. The procession had been oblivious to the fact that the visitor had entered Aldbourne from another direction but word was quickly sent out to the parade and on its return the band “played a lively selection and the National Anthem”. After the meeting that was then held in Henry Palmer’s barn (where Glebe Close now stands) and that was attended by some four hundred villagers, the band then led a procession till they were met by a similar parade from Ramsbury. This was one of two political visitors to our village that year, the second was Walter Long M.P. The man who had rekindled interest in a band was Joseph Barnes Alder. Joseph was born on the 6th of October 1865 and was one of five boys inherent to Tom and Elizabeth Alder. Tom, an émigré from Ramsbury had married an Aldbourne girl and settled in the second of the Westfield cottages in Castle Street. Tom was a trustee of the West Street chapel and was also one of their Sunday School teachers. What musical talent either of the parents had is unknown but their children had many, the most gifted being Joseph. He is listed in census lists as an agricultural labourer but he also made his living as a hurdlemaker, sheepshearer and smallholder having plots of land in Grasshills and the North Fields. Joseph married Elizabeth Mary Sims and they lived for a short while with his father and younger brother in the “new cottages” though after they later lived for many years in Box cottage. You know it well, its thatch towers over the Methodist chapel in Lottage Road. They were blessed with three children, one of whom was Reginald. He once won a gold medal for his wonderful singing at the Crystal palace. Joe was to become without question Aldbourne’s most esteemed man of music ever for he dominated around fifty years of this village’s musical events. He was the organist for his chapel and 1923 saw a presentation of an “ebony time piece” for his 40 years of devoted service as both the organist and choirmaster. He was also the natural choice as conductor of the United Methodist choir and he had several successes with them in local competitions. Also a very talented cello player and a prolific arranger and composer, with some of his work being performed as far away as America. All this aptness made him the obvious choice as the organiser of both chapel and village musical events. 1929 saw him being awarded prizes in “Messrs Blackberry’s competition class C”, I wonder if any of his compositions or arrangements still survive? Aldbourne’s Bill Deacon and Nancy Barrett both remembered him well and Bill described him as a very accomplished musician. Bill once lived opposite him and Joe would often call on Bill’s parents to ask if it was possible for “the boy” to help him on his small holding. Like any child, always keen to miss on a day at school, Bill frequently did. 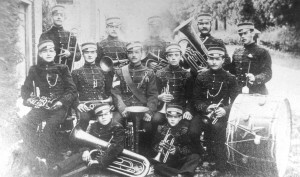 The c1885 photo shows him with his newly formed band and among its members are his four brothers and we will of course look at them in more depth. Although I made mention of his bands earliest engagements elsewhere the ones that ensued were as follows. In 1886 two parades were led, the first for the Aldbourne Friendly Society parade and the second for a November 5th firework display. 1887 was much busier with involvement in a penny reading concert, the evening consisting of band, songs and of course readings. It was a typical village entertainment but just to add a little snippet of interest that night there was a full moon and the report tells us that its timing was “favourable to those who came a distance”. Next came the Aldbourne and Baydon friendly society parades and Lambourn’s Mutual aid benefit society where the band appeared in “neat uniform” and finally the Queen Victoria jubilee celebration (just how many jubillee’s did that woman have) that was held out in “West street meadow” (now known as Woodleys). Joseph’s time as bandmaster did not last long and by August 1888 he had departed for the report given on the Benefit club parade stated that “the band discoursed very good music throughout the day under the efficient leadership of Fred Palmer”. It would appear then that Alfred Palmer became the band’s next leader but this is not quite as it initially appears for this was probably a last ditch attempt on Alfred’s part to maintain a band presence. Anyway, it would seem he failed and so for the second time the band once again ceased operations. This turned out to be a privation for the village of seven years but the absence of a band did not stop some of the remaining bandsmen from still playing, if even only sporadically. In a Wesleyan Band of Hope entertainment in 1892 not only did bandsmen Tommy Liddiard and Albert Stacey sing but Tom Stacey and Fred and Tom Brind also played cornet solos. Joseph was leader till roughly the August of 1888 but what exactly was the cause of his egression? It was prior to Joe’s leadership that our village first saw the exodus of families who moved away to find work in London. But grass always looks greener doesn’t it? And although Joseph too was one who decided to up and move away he and his family didn’t enjoy London. Joe’s 1936 newspaper obituary told that he “declined to stay away and soon returned”. In 1921, Sir Felix Pole of Great Bedwyn was made the general manager of the Great Western Railway and his association with our area made it relatively easy for local men to get work on the railway and even during the difficult times of the thirties John Dore, a local Methodist lay preacher also helped some of our villagers find work on the Hungerford line. William Deacon, our medal winning euphonium player of that period was one of the reported “7 fine players” who was forced to move from the village in order to find work due to the depression in the agricultural industry. What of the other four Alder brothers? All of them moved to the London area at one time or other. Frederick Charles Alder on his departure to London became a painter for the GWR. Musically he played a tuba for the GWR Paddington band and one of his two sons also played in that band in later years. Fred returned here during the latter half of the first war after which he rejoined his native band. He can be seen on the 1922 and 25 photo’s stood next to the set of tubular bells. He was a regularly featured playing them and incidentally Fred actually made them, what a talent! After the war he lived in Lottage Road and worked for a local builder as a painter and decorator. Later he ran a wet fish shop in West street for a few years. His claim to fame is that he wrote words to the band’s then signature tune, a march entitled “The Good Old Pride of Aldbourne”. Members would sing the words and the lower pitched instruments would play the melody, the band were still performing this march at concerts well into the fifties. A man with a jovial disposition, he died in 1928. James Alder was born 31 January 1861. He married Elizabeth (nee Wherrel) and when he moved to London he found work as a porter and later as an omnibus conductor. They had 7 children, their oldest boy Frederick, also became a bandsman. James did not return till ill health over took him at the young age of 46 and his return c 1905 made his home in West Street. William Alder too moved away but like his brother Joseph did not choose to stay too long either for he and his wife Martha nee Witts (they married in 1885) had returned before 1891 to live in Baydon Street. William played the trombone and can be seen on the 1885, 1909, 12 and 14 photographs. Petro, for that was the nickname given to him by the young lads of our village on account of the way he pronounced the word petrol was born in 1862 and died in 1932. Of Archibald little is known. Born in 1877 he was by far the youngest of the five brothers and he too moved to live in London. He married, had a daughter named Millie and just might have become a tenor horn player with the Paddington band. A 1912 report of a visit to our village of that band said that 7 Aldbourne men were then playing with them, “four sons and three grandsons”. Who these seven were is not easy to work out but I believe I’m right in thinking that they were Fred Alder on tuba, his son Joe on cornet, Frederick Alder son of James on euphonium, Archibald Alder on tenor horn and the three Barrett brothers, Frank on tuba and John and William both on trombone. It has been said that some of our bandsmen were involved in the formation of the GWR Paddington Borough Silver Prize Band (to give them their full name) but this cannot be correct however as this band was already formed many years before the exodus of Aldbourne folk and is confirmed with a report that the Paddington band played at the ” GWR widows and orphans fund fete” held in Hungerford in June 1860, the very same year that our own band first came into being. As to why Joseph Barnes Alder did not rebuild his band on his return c1890 or why he had few dealings with them ever again is not known but ill feelings due to desertion and letting the band down must top any list. He had returned after only a short absence but we must conclude that his services were not wanted by the men he had left behind. There were no further instances of a band for six years or so and Aldbourne seems once more to have had to make do with the engagement of bands from elsewhere. I’m positive that if a band had existed during those years it would have been mentioned and the MT agent S.Liddiard, when airing his views in a 1896 report said that we were becoming “quite an unmusical village” so this too reinforces this absence. Bands were invited and a chronologically ordered list includes the following. For the years 1889 and 1890 no bands are mentioned at all but in 1891 and 1892 the Bishopstone band, led by W Rigley, came. In 1893 the two regimental bands of the 1 ST Durham and Northumberland Fusiliers performed concerts on our village green. In 1895 “the band” is cited in a “cricket club” festival report and in 1896 and 1897 the Inkpen band played in both the hospital parade and flower show. Also in 1897 the Hungerford Town band came for our Rational Sick and Benefit society and in 1898 the Bishopstone band, led on that occasion by a Mr R Retford once more came for the hospital parade and flower show. Before moving on I want to make one thing perfectly clear. The dozens of village agents who have worked for our local paper have, when writing about their own village events most commonly have written “the vicar” or “the choir” when referring to individuals or groups that belong to their particular village. Most visiting dignitaries are recognised as such and so the 1895 reference to “the band” must refer to one that belonged to Aldbourne. If I’m right, and I am 100% sure I am, it must mean then that our band re-existed in 1895. I did say earlier that the history of our band was not boring didn’t I?